2017 Cash for Christmas Giveaway! - 5 Gift Cards to Win! 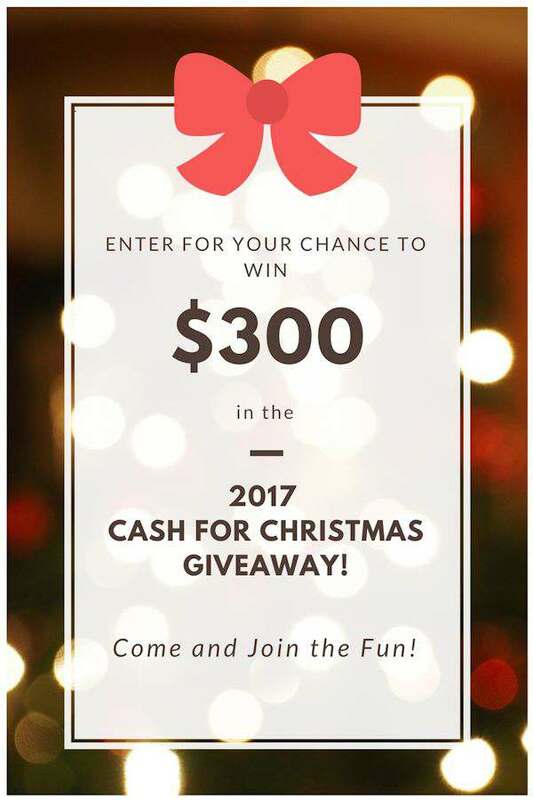 2017 Cash for Christmas Giveaway! I usually would shop throughout the year. But this year, we simply have no money, so we’ll have dinner and each other, but no gifts. I pick up small things throughout the year, but then get more serious about it after Thanksgiving. I do most of it online now anyway. Wow, you’re totally on it! I usually do my holiday shopping after thanksgiving in-store but I shop before thanksgiving online if I see a deal too good to pass up. I have done all my Christmas shopping before Thanksgiving. I am F-I-N-I-S-H-E-D. I always start my Christmas shopping after the Thanksgiving holiday. Some years, my shopping is done before Thanksgiving. But, most of the time, my shopping is done afterwards. Before if at all possible! I do most of my Christmas shopping between Halloween and Thanksgiving. I also do most of it online. I like to begin my Christmas shopping as soon as possible but I also like waiting for Black Friday and Cyber Monday. I do most of my shopping after Thanksgiving in December. I hit up sales and clearances when I see something good but I usually get most of it late year. I shop year round for Christmas so most of my gifts are purchased before Thanksgiving. I don’t start shopping till the first part of December but this year I am on a trip to Hawaii so I started getting a couple of fun things for my family. I do my Christmas shopping all through the the year so I guess my answer would be before Thanksgiving . I usually start right around Thanksgiving. Now that I have kids, I do most of my Christmas shopping before Thanksgiving because I like to have time to do holiday activities with the family instead of rushing around getting gifts at the last minute. I have to wait until after Thanksgiving because of bills. I do most, if not all of my Christmas shopping after Thanksgiving. I’d say mostly before, but I tend to buy or try to win gifts throughout the year, so it depends on my luck and deals. I would say its a mixture, but I do most of it after Thanksgiving. This year I have started earlier than usual though because I have a baby due in a few weeks, so I k now time will be limited after that! I usually start my holiday shopping after Thanksgiving. I do all of my shopping online throughout the year and avoid stores during the holiday. I even buy my groceries to be delivered during the crazy holiday season. I do all of it after Thanksgiving, I always try to start early, but it never happens that way. I wish I could say that I do most of my Christmas shopping before Thanksgiving, but I never do! Usually most of my purchases are in the latter part of November and early December. MOST SHOPPING ON THANKSGIVING ON LINE, THEN BLACK FRIDAY. I try to have all my shopping done by the end of November! I already bought two gifts today. I start decorating for christmas November 1st but start shopping usually end of November! I do about 3/4 of my shopping before US Thanksgiving (I’m Canadian). I do most of my shopping after Thanksgiving, which is mid-October in Canada. I do most of my Christmas shopping after Thanksgiving. Usually on Black Friday or Cyber Monday. I do most of my shopping after Thanksgiving because there are better deals in my area around that time. I do most of my shopping after Thanksgiving, usually at the beginning of December. November is already hectic as is, and I think the best deals come out after November ends. I do it after.. Usually better deals.. on events like cyber monday black friday etc. Well I do mine after thanksgiving but of course I’m canadian so that’s a bit longer than those to the south. I try to do some Christmas shopping through out the year. But I do most of mine after Thanksgiving (Canadian). This is so awesome, I love your blog. Thank you so much for the offer!